Development Education is aimed at giving an understanding of developing countries and their place in society. It challenges perceptions and stereotypes by encouraging optimism, participation and action for a just world. Irish Aid’s WorldWise Global Schools is the national programme of Development Education for post-primary schools in Ireland. 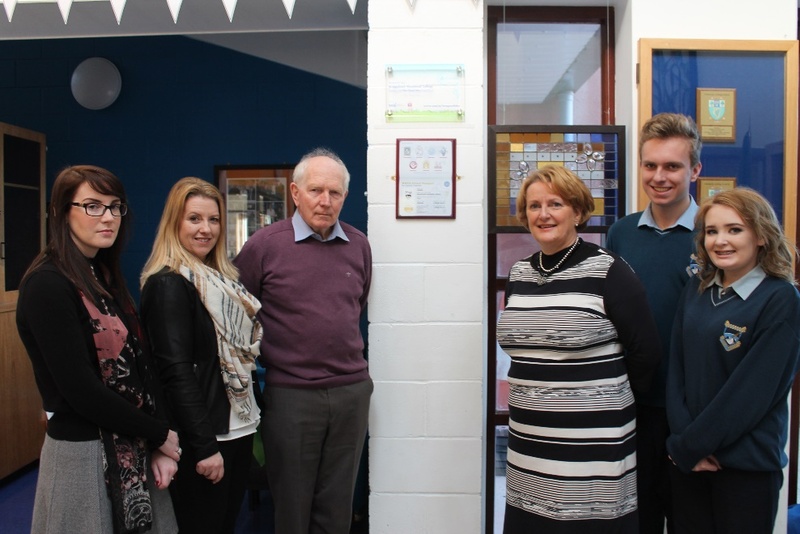 It was introduced to our school in 2015, two years after it was founded. The programme aims to increase the number of schools that are involved in quality development education. To do this they provide a broad range of supports . WorldWise Global Schools wants to enrich learning for students and staff. This will help us understand the world better. Development education shows us key skills that we will require for life. In our school Development Education focuses on a wide variety of subjects. These include: English, Geography, CSPE, Home Ec., Art, Business and many more. We have two noticeboards in the school displaying information and projects. The Board and management ratified the schools policy last March. There is also a Development Education section in the Bridge to keep teachers and students abreast of events and initiatives taking place now and in the future. Our school also received our Global Citizens Passport and received €1700 of a grant this year. What has our school done? * Last year, Ms. Roche’s 2nd year geography class worked on gender inequality. 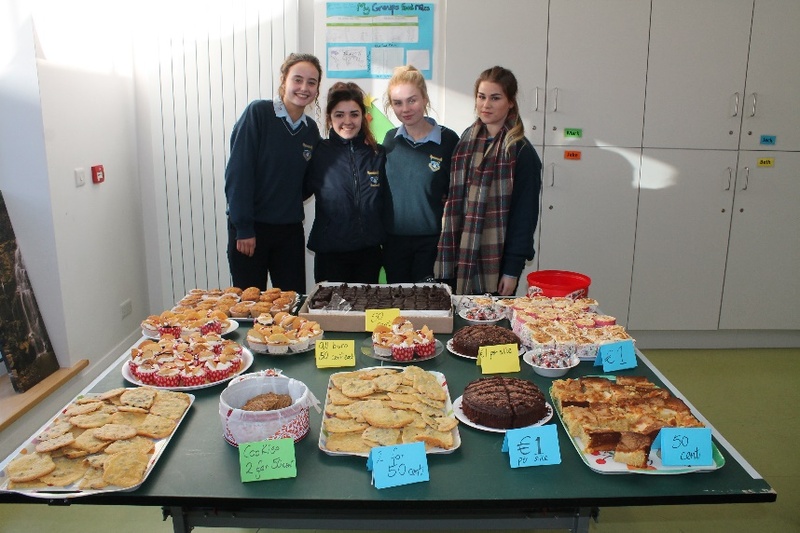 * First year geography classes organised a bake sale for Trocaire and also had a talk from the charity. * Fairtrade workshops were organised for 1st year Home Economics students. * Art students used recycled materials from ‘ReCreate’ in Dublin. They designed and created an indoor garden. * Poetry Ireland and Trocaire held a poetry competition ,first year english students entered this competition. The topic was the Syrian Refugee crisis. 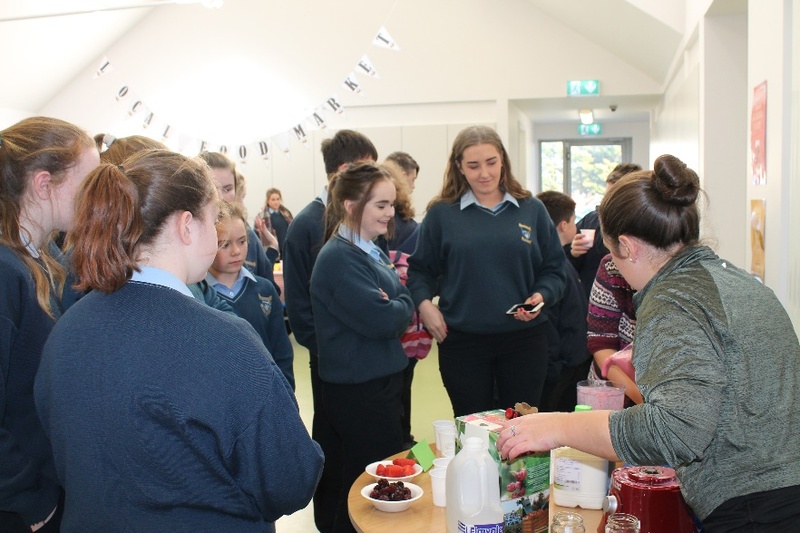 The school also held a ‘ wear red’ day in aid of Trocaire raising €460. This idea was part of a CSPE action project. * Our geography class also had a workshop from GOAL where we learned about and discussed the Syrian Refugee crisis. This was very interesting. * TY students did a project on Climate Change. They also did a project on social inequality. They visited the Irish Aid Centre and also learned about the sustainable global goals. 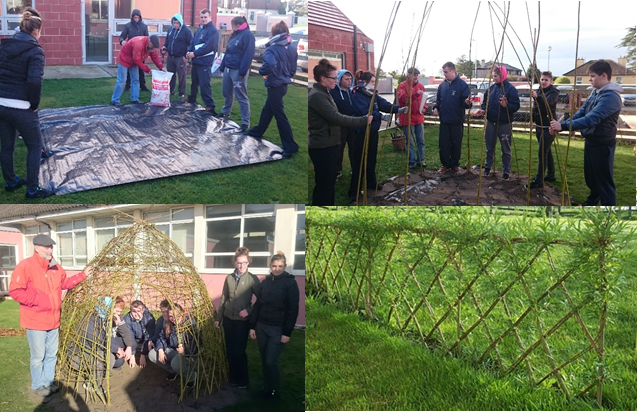 * Ms. Norris organised a willow weaving workshop which took place in the ASD sensory garden. * The garden in the ASD unit which was part funded by Development Ed. and school completion with involvement from LCA and JCSP students. * Concern Hunger Heroes workshop with Ms Kelleher’s TY class and Ms Jordan’s CSPE class. * Ms. Kelleher took TY students to visit to the Irish Aid Centre. * Ms. Fitzgerald organised a bee keeping talk which focused on the importance of bees in the world. * Global food miles project. * Concern fast which a number of students from Ms Norris’ and Ms Kelleher’s classes took part in as well as the teachers themselves. TY Geography class also took part in a bucket collection in town to raise money for Concern. In Geography class we took part in workshops on gender inequality, which is the fifth global goal and also had a speaker from GOAL who carried out an interactive workshop while informing us about the Syrian Refugee crisis. Both were very interesting as they taught us things about global issues. It taught us to accept everybody for who they are, forgetting about religion, race, gender etc. It was also very informative as the Syrian Refugee crisis was and still is very current. It informed us about the less fortunate in our world and the struggles they have to endure on a daily basis. It made us realise how much we take for granted but also that we, as individuals and as a society, should take action to help those who suffer unnecessarily. We would recommend these workshop to everyone in every school. Knowledge empowers change and it starts with you! Our 3rd year religion class (Ms. Kenna’s class) is currently completing a Young Social Innovator’s junior action project, where we identified a social issue that concerned us and will raise awareness about it. Young Social Innovators was set up by Sr. Stan and has been on the go for 15 years. Throughout this time endless social issues have been tackled such as gender equality, consent and LGBT issues. Our project tackles the subject of appearance and the problems that go along with it, for instance, making judgements on someone’s character and background solely on what they look like. We aim to make this project as fun as possible whilst socially educating at the same time. 25 schools nationwide entered and we managed to be 1 of 5 schools that got highly commended. Paul came in to teach us how to play different types of African drums. He was from a group called Afroeire and he came from Dublin. He taught us about the different types of drums and the different sounds and rhythms each drum makes. The drums originated from west Africa and they form a very important part in the African culture. They brings neighbourhoods together. Mali, Guinea and Senegal are where he talked about the most. I played the drum called the Doum Doum and you have two sticks to hit the drum. A djembe drum is a drum which you hit with your hand and when you hit the middle of it, it makes a different sound. The top of the drum is made out of cow skin and the body is made out of wood. The blacksmiths make agogo bells. In Africa black smiths are still around and make lots of things. 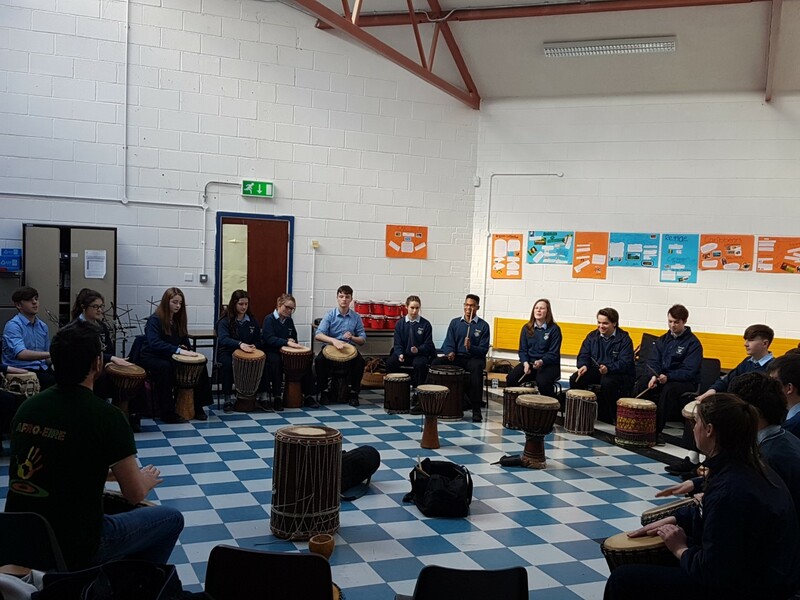 I liked the drum workshop because it taught us a little bit about African culture and how they have different drums for different beats. I also found it interesting that there are still blacksmiths in Africa. In order to stir up some interest among our school community in the Concern Fast Ms Kelleher invited a speaker from Concern to talk to pupils. A number of students from Ms Kellehers’ 5th year and TY Geography classes took part in the fast on November 24th 2016 , as well as Ms Norris 2nd year Geography class. The TY students organised a bucket collection for Concern in Wexford town, this was a highly successful day and over 400 euro was raised. Just three classes, along with the help of Ms Norris and Ms Kelleher, raised 1,100 euro for Concern. This was a fantastic achievement for all involved and we hope to raise a lot more next year. On the 29th of November 2016’ Philip McCabe, President of The Worldwide Beekeepers Association came to our school to do presentation on the bee population in the world. The bee population has been rapidly decreasing since 2006 and people don’t really see how serious this situation is. If the bee population depletes fully then we are at serious danger of running out of food. Without bees there can’t be pollination of plants. This means that the plants would not be able to reproduce, which isn’t so great for us! In this case many crop items that we depend on would run out, e.g. oranges, apples and raspberries. The main reasons for the decreasing bee population is intensive agriculture, the loss of biodiversity, pesticides and pathogens. There are multiple pesticides that are highly toxic to bees. Examples include Methyl parathion and Methoxychlor. Methoxychlor is a general use pesticide and Methyl parathion is an extremely hazardous pesticide. All second year Geography Students went to view the presentation , along with members of our school ICA Branch. Personally, I found the presentation interesting. Crocuses, Daffodils, Tulips and more! In October 2nd years, JCSP went out to the garden. The second years planted tulips and daffodils. As our teachers brought us out, we had to use equipment to plant them. The equipment we used was as follows dibber, labels, spade, compost, bulbs, gloves and pots. We only had to bring our own pots. We went out to the garden. Our teachers instructed us on what to do. Firstly, you need to get ready your equipment and after you did that you fill your pot just over halfway. Next you use your dibber in a circular motion to make a hole for your bulb. Your next step is to plant your bulb in the hole make sure you plant the bulb with the roots facing downwards. Last, but not least you clean up your equipment and put them into the storeroom. On 31st March, the 2nd years brought the 1st years out to the garden. The 2nd years got two 1st years each and taught them how to plant bulbs and how to use the equipment. The 2nd years had to get the equipment, as the 1st years didn’t know where the equipment were. As the 2nd years got the equipment they were paired with 1st years and taught them on what to do and at the end we cleaned up the equipment. Next, the 2nd years brought the 3rd years out as well. The 2nd years did the exact same thing with the 3rd year . The 2nd years got out their equipment and they paired up with a 3rd year. They instructed 3rd years on planting bulbs. When they finished planting their bulbs, the 2nd years clean up the equipment and swept the yard as it was messy after the compost. We, the people of Ireland naturally love to hold local agricultural events during the summer to mark the great year of produce we have created in our local communities. The feeling of knowing the contents of your meal and its origin is always reassuring and healthy for us. The Grow It Yourself program encourages this positive idea all over the country. The program started from humble begins and slowly expanded not only through Ireland but through the entire world. The founder Michael Kelly created the concept in county Waterford on the year 2008. It began as a very small interest for him as he started with producing a small amount of garlic. He sook more knowledge online about growing foods which led him to create the idea of GIY with a group of people online. This idea spread virally and soon events and campaigns were occurring throughout all of Ireland and the GIY program fully established itself. It began to receive more recognition and followers as the years went by. We now come to the year 2017, and Bridgetown vocational school has been given the offer to partake in this pro-active movement. We are given to choice to join a GIY group in our school. We already have a growing number of members and are looking for more to join this brilliant activity. We are open to new ideas of things to grow and have a wide variety to choose from. Foods like fruits and herbs and are being produced in the garden area in the Unit. Not only are foods being produced but, flowers are also being grown to support the bees who are in need of desperate protection in recent . All of this cannot be properly accomplished without YOUR help. This program is highly productive for us as a community and all help will be greatly appreciated. «Join a GIY group in your school or local area. «Get the knowledge and products you need by becoming a GIY subscriber. As part of our Development Education Programme in Geography class, we had been looking at the fall in the insect population worldwide. This has been mainly caused by pollution and the use of pesticides in farming. We looked at simple local things that could be done to improve biodiversity. We decided to try and build a bug hotel for our school. Five 2nd year students that were in both the Geography and Woodwork class worked on the project – Horens, Ben, Chloe, Adam & Dion. We collected as many recycled materials as we could for the hotel, and worked on it during woodwork class. It is located in the outside garden close to the ASD unit. As a part of our Development Ed programme, Bridgetown College took part in a willow weaving workshop on Wednesday the 9th of November. Two groups of students took part in this workshop. The first workshop began in the morning starting at 09:10 and finishing at 12:10 (Jack Holden, Dylan Murphy, Chloe Halligan, Jessie Stafford, Dylan Walsh O’Connor, Nadine Cunningham, Josh Quigley Power & Denisa Paul). This was followed by the second class in the afternoon which continued from 12:10 to 15:35 (Lara Guthrie, Naoise Ward, Lila Dzlusajevaite, David Keating, Ryan Whelan & Evelyn Murphy). We were introduced to a man called ‘Terry the Weaver’. Terry showed us pictures of previous creations he had made by weaving willow, to say they were impressive was an understatement! It was decided that we would make a Fedge (mixture of a fence & hedge) and a hut, or “Spongebob’s Pineapple” as one excited member of the group kept referring to it. The first team put down the foundations and started to build the hut. A circle was measured on an area of grass at the front of the school and we lay down weed matting and sand on the circle. Then Terry gave us all living willow whips to stick into the ground around the circumference of the circle which were then tied at the top with string to secure the shape of the hut. The second team then finished the hut and started working on the fedge. To finish off the hut we wove willow sticks horizontally into the vertical hut frame and stuck the ends of the sticks into the ground as so later on they will grow. Once this was finished we started to make the fedge, we marked a line on the grass and started to diagonally plant the willows on the line and tying them together with string where they crossed over each other so that it formed a criss-cross pattern. These wonderful garden structures will grow over time and will need to be taken care of. Once they grow the willow will start to stick out of the structure making it look overgrown and untidy, and will need to be woven back into it, making it look much neater. Planting willow has many benefits such as cleansing nitrates from soil, absorbing water from the ground in wet areas and can be used for building, firewood, basketry, fencing and much more. Both groups put in very solid work to create something unique that the school is now proud to showcase. Well done to all involved and of course thank you to the group of teachers who organised this thoroughly enjoyed activity. Global goal #5: Achieve gender equality and empower all women and girls. Gender equality is the state in which access to rights or opportunities is unaffected by gender. This means that the different behaviour, aspirations and needs of women and men are considered, valued and favoured equally. It is important because women and girls represent half of the world’s population, and therefore also half of its potential. Many things are unequal in the world, for instance, child marriage affects girls far more often than boys. Globally, nearly fifteen million girls under the age of eighteen are married every year. Education is very unequal as two thirds of the world’s 774 million adults who cannot read or write are women. This proportion has not changed over the past two decades. In some countries, girls are deprived of access to health care or proper nutrition, which leads to a higher mortality rate. Regardless of where you live, gender equality is a fundamental human right. Advancing gender equality is critical to all areas of a healthy society, from reducing poverty to promoting health, education, protection and the well-being of boys and girls. Societies that treat women as equals are known to be more peaceful and prosperous. However, though one hundred and ninety-two countries assert equality and non-discrimination in their constitutions, every country has laws that treat women and girls as second- class citizens. Legal inequality can prevent girls from going to school, or women from owning property and can even promote violence against them. Often, countries are not strict enough with their laws regarding equality or women’s rights. For example, despite FGM (Female Genital Mutilation) being outlawed in Ireland in 2012 and almost four thousand girls here having become victims of it, there have been no convictions under the legislation. Also, trafficking women and children is the fastest growing criminal enterprise in the world despite the fact that international law and the laws of one hundred and thirty- four countries criminalize it. To help spread gender equality, you can do many things such as being aware of gender stereo-types, promoting the cause on social media and standing up to harassment and bullying. You can also show your support for gender equality by signing up for the UN Women’s #HeForShe initiative – a solidarity movement for gender equality that brings together one half of humanity in support of the other half of humanity. In doing so, we are helping the world to become a better place and are providing future generations with a chance to be equal. Climate change is caused by human activities and is threatening the way we live and the future of our planet. The average sea level rise is predicted as 24-30cm by 2065 and 40-63cm by 2100. Because of the rising levels of sea water some countries are under threat of being swallowed up by the water. For example, in the Netherlands 47% of the population is in danger, that is 7,793 people. And I know that that does not seem a lot out of the seven billion that live on the planet, but losing one person is bad, never mind 7,793. If sea-levels rise up to one meter only, Bangladesh could lose up to 15% of its land area and around 30 million people living in the coastal areas of Bangladesh could become refugees because of Climate Change impacts. Climate change is caused by us, humans. We burn fossil fuels which adds to the blanket of gases in the atmosphere, which then results in more heat being trapped, causing the temperature of the earth to increase. If the temperature increases, some areas of the world will come to be inhabitable. As a result, different parts of the world will become overcrowded and overpopulated. Another thing we don’t do is recycle properly. Plastic is not biodegradable so that means it cannot be broken down. If we do not recycle plastic properly and we leave it lying around, in one year that plastic will still be there. Some ways to reduce climate change: reduce, reuse and recycle, ride a bike or walk to places instead of driving, pack waste free lunches and reduce energy and water use. I know parents and teachers always talk about switching the tap off when you brush your teeth or using cold water to wash your hands instead of waiting for it to heat up, all the time everyone nods and agrees but then they don’t do it. If we were to reduce our water use by doing the things teachers and everyone says, we would be helping the planet, and I know most people would say “how can I, one person, out of the seven billion people in the world help stop climate change?” If every single person in the world reduces their water usage, we would be saving the earth. By doing everything mentioned and being environmentally aware we will save lives, money and most importantly, we will save the earth. 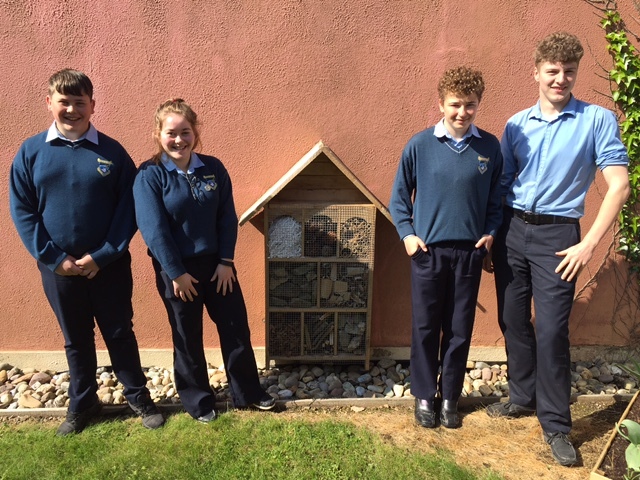 The sensory garden was made by the Leaving Certificate Applied class. It is outside the ASD unit. We started working on the sensory garden in April 2016. Before we started working on the garden, there were tarmac and weeds all over the place. It just looked boring and not a place where people would want to spend time. Our class decided to do it up as part of our Enterprise module in LCA. First of all, 50 tyres were brought in for us to use as flowerpots. Ms. Cahill’s husband kindly brought these tyres down to the school for us. We painted the tyres all different colours. We used bright colours such as Blue, pink, green and yellow. 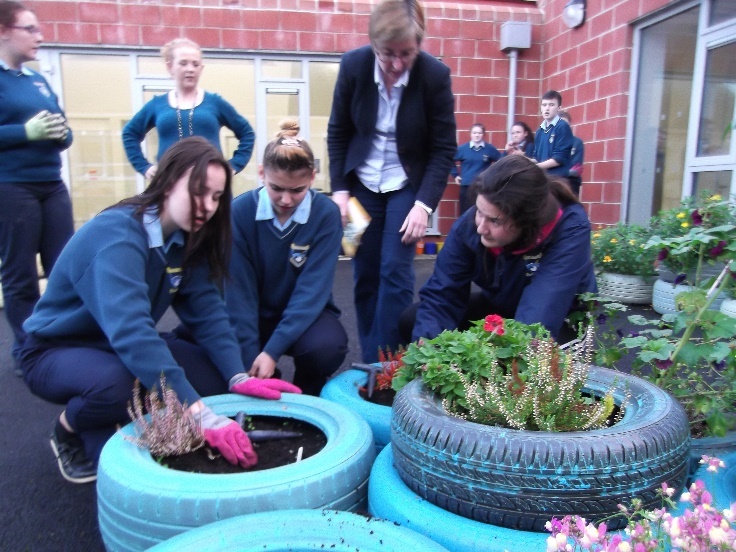 We planted flowers and plants in the tyres, I made a minion tyre plant out of 5 tyres and I planted daffodils in it. Now all of the tyres are painted in different colours and there are flowers growing in them. Sleepers were brought in for us to make beds for growing herbs and vegetables. Some LCA students made brackets in metalwork class to help join the sleepers together. Kilmore Potatoes kindly donated top soil to fill the beds with. Today we have a herb garden in one the beds with herbs such as: Mint, Fennel, Lemonbalm, Bay, Tarragon and Parsley. We also have peas, broccoli, lettuce, garlic and onions growing in the vegetable bed. We made things in metalwork for the garden such as bird feeders, hangers for the tyres on the fence, wind chimes, compass, a flower decoration on the wall. These things help to decorate the garden and are also sensory items. This means they appeal to our senses. We can hear the wind chimes, see the bright colours, smell the flowers and herbs and taste the herbs and other foods. We also have a number of plants which are very nice to touch because they feel furry or soft. We have a compost bin to make our own compost. In this bin you can put teabags, fruit and vegetable peelings, eggshells and other raw foods. We are also collecting rainwater which can then be used to water the flowers. I enjoy working in the sensory garden, I do a lot of watering out there on the plants and the vegetable beds. I enjoy it out in the sensory garden because it’s a very nice garden to be out in on a sunny day. It’s good to get fresh air in the garden and it’s nice to learn about growing flowers and food so you know what to do in the future if you’d do gardening. It is a very nice place for students to be at break time and lunch time. I am happy to be part of LCA and to make the sensory garden a nice place for students in school. Why do you think we had a local food market day? For us it was raise awareness for the increasing amount of imported products that we demand. Little do we know that many of these foods can be grown in our own homes. Encouraging this has many benefits not only to you but to the economy we live in. To give an example of the food we import, here is short table listing some foods that we have noticed are in demand. All these foods can even be grown in your back garden! The event we hosted was supported by many local Wexford suppliers – Killowen Yoghurts, Glanbia, Baldy & Doyle, Thai Gold, Frank Doyle Butchers, Wexford Home Preserves, Scallans Food Factory, Paganini, Uncle Aidan’s Stone Ground Flour, Greenhill Fruit Farm, Saltees Fish, Ballycross Apple Farm & Kilmore potatoes. Just by supporting local companies, we are not only employing people in our communities but we’re also helping local Irish businesses grow. The food itself is pure and we are guaranteed that no additives are present in the fruits and vegetables we eat. Also by buying local our communities will grow and our health will improve. Instead of buying a frozen pizza that you know is bad for you, you could enjoy a fresh strawberry or apple on a lovely summer day, filling you with prosperity and happiness. The market we hosted can be only one of many if you and I decide to help this amazing opportunity grow into a local tradition. The day itself was amazing and many people were glad to see their hard work pay off. In total it raised 492 euro, which will be spent on the school garden project. All we want for you is to consider your dependency on imported foods and help support this wonderful local idea. Unveiling of the WWGS Gobal Citzens Passport.